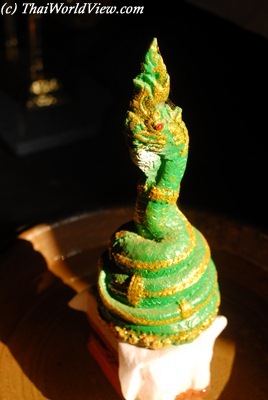 The snake (งู) is playing an important part in Thai Buddhist culture. Indeed in old Buddhist legends a snake or "NAGA" (นาค) changed his appearance into a man in order to enter monkhood. Since that time, during the ordination ceremony, the candidate to enter monkhood must answer the question if he is an humain being or not. 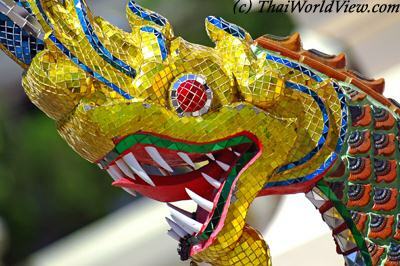 If a Thai woman dreams and sees a snake during a dream, she will find the man of her life in the next coming days. If a Thai woman dreams being bitten or crushed by a snake, this means she is about to be united with her true love. If somebody sees a snake going in front of him, he will receive money in the next coming days. If a big snake is staying in the temple and sleeps there, it is a spirit coming back. Before digging the main hole for the most important pole of a new house, a ceremony for the "NAGA" is performed. 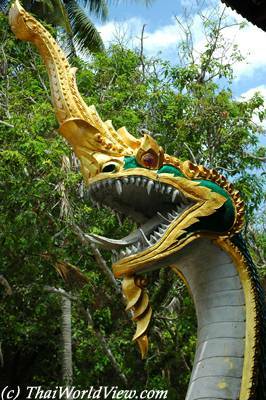 The "NAGA" is believed to lie underground. The Snake Farm has been set up to produce anti-venom serum for snake-bite victims. It is located in Bangkok. The snake kite (ว่าวงู) is a popular toy of the past. This kite has a snake head but the wings can feature any other kinds of pictures. Nowaday it is still quite popular and can be purchased in front of Sanam Luang in Bangkok when the kite season starts. Of course many venomous (งูพิษ) and non-venomous snakes can be found in Thailand. Another popular former toy is the woven rattan snake (งูดอกไม้ไผ). It is a kind of mechanical toy as it can snap a finger just like a real snake. Some Thai idioms are related to snake. A dirty old man, who is flirting, is called "snake head" (เต่าหัวงู). 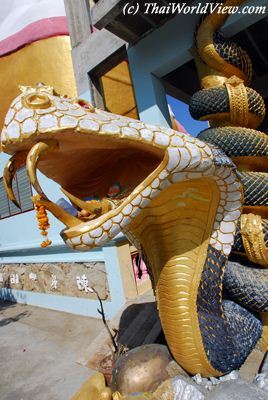 Inside Thai Buddhist temples, there are often "Naga" decorating the stairs leading to the main chapel entrance.